September at last! my favourite time of the year. All those sharpened pencils and fresh notebooks? I love it! I have a school story ready for Storytelling Sunday tomorrow: how about you? First Formers and Freshers are very welcome: so if we haven't seen you before. come on over and show us your story. We'd love to see your name on the roll! 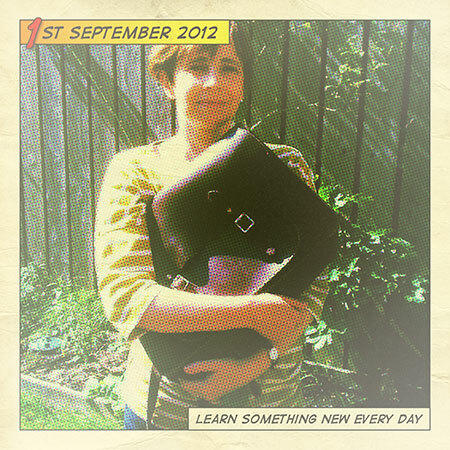 For today I'm showing you my satchel as I get ready for another session of Shimelle's Learn Something New Every Day. Every year it's the same - I think I've got plenty of other things on; and every year I change my mind and join in at the last minute. Never regretted it. Last year I did tags, the year before little notecards. This time round I'm going to be using photos. The same Halftone app I made cards with earlier in the year. What I like about this one is that it adds the date for me and gives space for a sentence or two. I'm going to try to keep it short - distil what I've learned into a few words. Maybe I'll get one done every day, maybe I won't; but I'm going to give it a try. **sigh** so many things to do, and not enough waking hours in the day. Love that satchel, and also that you are using halftone for your LSNED. What clever ideas you have. I think i'll be ready for tomorrow! Heheheheee, I was wondering if you would change your mind! I am not in this year. By the way, I might be late to the party tomorrow, it's Father's Day down here and we have an outing planned ... two actually. Great photo and I love the comic strip style. Is it easy to use? Love the idea of using photos and short captions as the basis of LSNED! This is my first year doing the class, and I haven't decided on a format yet. Must go check out this app! I did finish LSND last year and loved it. 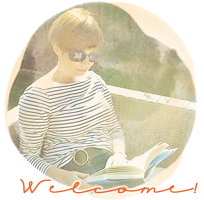 This year, I'll be using the 4x6 cards Shimelle provided to make it fast and easy for me. I haven't learned anything yet today so I'll be posting each card the following day. This is a lovely idea Sian, the photo idea with a caption is perfect. I've never taken part in LSNED and often wonder if i should! Decided late last night to join in on the LSNED so signed up. I've done my normal 'not going to do it again this year' and then seen other people's pages and decided to join back in! I'm going to write something on the printables and then decide what to do with it all. Looking forward to a morning of Sunday stories tomorrow. Since my pennant pages are so small, I'll definitely have to distill my journaling. No story has come to mind for me yet, but if one does, I shall be sure to share it. I've missed SS! That's a lovely way to do LSNED, Sian. I'm hoping to finish last years album tonight so I can start my next one. Detention for me already! Glad you are joining in, and look forward to seeing your photos. I'm following along this year by reading the prompts, but not creating anything specific. However, I'm sure I'll find some inspiration for a few layouts along the way and a blog post or two. Great photo idea for this year. Love your idea for LSNED - love the app and your satchel!